Gibraltar's chief minister has joined in the war of words between the UK and Spain over British involvement in the territory's 300th anniversary party. Spanish MPs have labelled a proposed visit by defence secretary Geoff Hoon as an "offensive action" to Spaniards. But Peter Caruana said Spain had "no geographical case" to interfere. "For the Spaniards...to try and lecture us on how we should commemorate that is none of their business and somewhat impertinent," he told BBC Radio 4. Gibraltar has been a source of dispute between London and Madrid since it was seized by Britain in 1704. Spanish Foreign Secretary Miguel Angel Moratinos has said it was "not easy to maintain normal relations with Great Britain" because of the Gibraltar issue. And Socialist MP Diego Lopez Garrido added: "I think it is a bad decision. It is unnecessary and could be an offensive action against Spaniards." 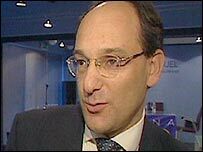 But Mr Caruana hit back, saying that Gibraltar is an obsession of Spain's political classes. He told BBC Radio 4's Today programme: "We are not celebrating a military battle fought and won by British forces in 1704. "We are celebrating the 300th anniversary of British sovereignty and our relationship with Britain which has given us everything we have." He accused Spain of trying to make a live issue of Gibraltar's sovereignty, which he says is a settled issue. 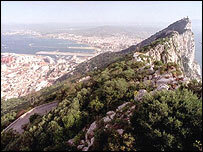 The row is the third time in three months Anglo-Spanish relations have been strained over Gibraltar. In June there were protests over a visit by Princess Anne and in July a port call by the British submarine HMS Tireless drew criticism. The tercentenary celebrations began on Saturday with the arrival of HMS Grafton in Gibraltar following a tour of duty in the Persian Gulf. On Wednesday a military parade will be held and the Royal Navy granted freedom of Gibraltar. "Gibraltar's plans... now seem to be worsening relations again"